I’m quite proud of this photo. Feel that it captures just how rich and luxurious the dish is. And how simple too. Seriously, it couldn’t be easier. 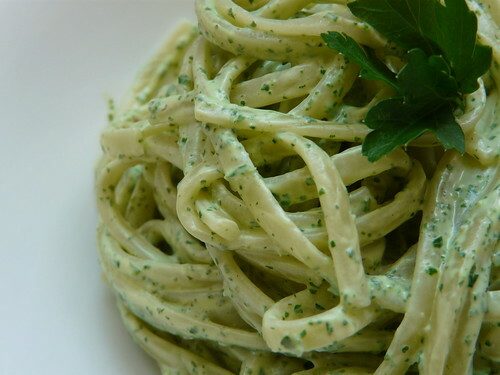 Simple whizz up the cream, parsley and garlic in a food processor until a pale green, slightly speckled sauce is formed. Season very carefully and stir through the cooked tagliatelli. I ate this recently with a side salad of roasted asparagus and courgettes with fresh peas. This looks so beautiful and yummy. Yay! Someone who recommends using white pasta! I’m a whole grains gal, really I am. Except when it comes to pasta. I just can’t abide the wheat pasta. And you should be proud, Wendy; that’s a gorgeous pic. What a stunning photo indeed – so often the simplest combinations are the best! lovely photo – you do simplicity well – I often want to add vegetables and mess with delicate flavours! thanks for the advice! Yum yum yum yum yum! Simplicity is beautiful isn’t it? Wow! This is exactly the kind of simple sauce that I love. And I have a good crop of parsley just now, too. I will have a go at this – I am focussing on back to basics simple but very good food at the moment. Susan – I do like wholewheat pasta, I really do. But not with creamy sauces. It’s just not right! Antonia – Thank you. And I couldn’t agree more. Johanna – I have to fight the urge too sometimes! Jen – Oooh, lucky you. My garden parsley isn’t doing terribly well this year. Hippolyra – A good focus, I think. Think I’ll do the same in the coming weeks. But, the recipe sounds great and could replace my simple feast of spaghetti with pesto, when Graham is out. Although that seem unfair as I think he would love it too! The picture is amazing and I have parsley gone crazy in my back yard – what a great way to use it up, as opposed to giving it to my sister for her pet rabbit. That does look really pan-lickin’ good! It does indeed look beautiful! I was just panning on making a parsley sauce with sour cream. You are so right, we need to learn and enjoy again simple stuff. Love your photo! Oh, I’ve got loads – LOADS – of parsley going mad. It must be tamed. Wendy, this looks soothing and iron-rich. awesome! Love these simple yet tasty recipe. Nice pic! Holler – Ah, you have the same comfort food as me! Glad you saw the pic, eventually. Nora – Hello! And thank you! The Italian pasta is always the best! That sounds reallt good, I love simple and easy pasta dishes, they are great when time is limited. are you married “with food like that ,you must be very happily married lucky man . Cempires – And they’re a real comfort food too.